As Roma failed to continue their recent run of good results as the capital club’s were beaten by Palermo this Sunday in the league allowing the Rossanero leapfrogging the Romans in the Serie A table. Goals from Fabrizio Micolli, Josip Ilicic and Antonio Nocerino only managed to get one reply from Francesco Totti right at end of the game, ensuring Claudio Ranieri’s fourth defeat in the season. Coming into the game from a dramatic victory in the Champions League against Bayern Muenchen, Roma started the game at Renzo Barbera with full confidence as they had the early chance to score through John Arne Riise’s long range shot. However, the home team didn’t take long to make a come back into the game as they also created chances soon after that through Josip Ilicic and Javier Pastore’s combination. As the half wears off, the match started to get exciting as both teams are playing offensive football and exchanging goal scoring chances, making their goal keepers worked pretty hard on the game. Looking a little bit sharper, the Rossanero finally took the lead in the 20th minute through Miccoli, who pounced on Ilicic’s fine cut back from the by-line. Starting the second period a goal down, Roma tried to come out a little bit more allowing more spaces for the home team to create more chances with their fast counter attacking football. Despite creating few dangerous chances through Francesco Totti, it was Palermo that successfully get the important second goal as Ilicic finished off Federico Balzaretti’s cross from the left side. Things gets worse for Roma few minutes later when Palermo scored the third goal after a fine worked from Pastore and Cesare Bovo counter attacking move that carved open the Giallorossi’s defense, leaving Nocerino lots of space to apply the finishing touch. 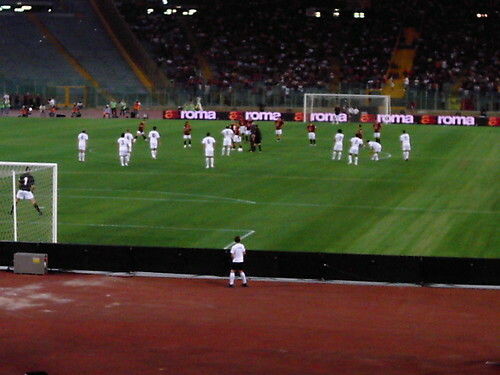 This goal dropped the intensity of the away side’s attacking game as they seemed to be running out of ideas although in injury time Totti did managed to score a consolation goal after springing the offside trap and send a fine shot to beat Salvatore Sirigu.